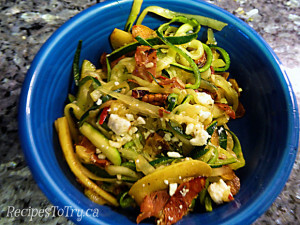 These zucchini noodles with prosciutto & apple are unbelievably good. So good you will have a hard time sticking to eating only a sensible portion. They’re also a great-tasting, low carb sub for regular pasta. ½ cup walnut pieces toasted. 1 apple, cored and thinly sliced. Toast walnut pieces in large skillet sprayed with cooking oil until toasted about 2 to 3 minutes. Set aside. Heat 2 tablespoons of the oil in the large skillet over medium-high heat. Add the garlic. Cook, stirring constantly, for 2 minutes or until softened and just starting to brown. Add zucchini; cook and stir for about 4 minutes or until tender crisp. Transfer to a serving bowl and keep warm. Drain any liquid in skillet and add remaining oil to skillet. Add prosciutto and cook for 2-3 minutes or until browned and crisp. Add to zucchini. Add apple to skillet and sauté for about 2 minutes until just tender soft. Add to Zucchini mixture. Add toasted walnut pieces, salt and crushed red pepper; Toss to combine. Top with Greek Feta cheese.